UPFA General Secretary and Environment and Renewable Energy Minister Susil Premjayantha yesterday confirmed that the presidential election would take place in January next year. Addressing the media at the Sri Lanka Freedom Party (SLFP) Head Office in Colombo he said that the election would not be an issue for the scheduled visit of Pope Francis from January 13 to 15. He also said that the SLFP had started its election campaign last month and stressed that it had an early preparedness for elections as usual. “We have taken steps to strengthen the SLFP membership in each electorate and also discussions are going on with its women’s organizations,” he added. Premjayantha also assured that the Budget-2015 which was scheduled to be presented in Parliament on Friday would provide more relief to the people, especially to the government workers and aim at development. Responding to a query, Minister Premjyantha said that the government had no intention to sling mud at the UNP but that party obviously had a hand in the recent decision taken by the European Union to lift the ban on LTTE. Premajayantha stressed that the past actions of the UNP and Wickremasinghe’s recent visit to London and his meetings with pro-LTTE lobby groups had shown that the UNP had given assistance directly or indirectly to them. 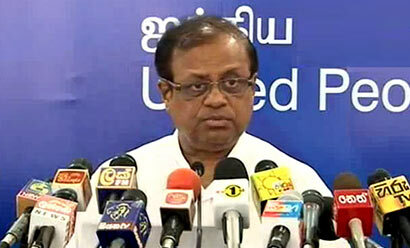 He claimed that the LTTE had emerged stronger when the UNP was in power. Accusing the UNP of having created a Tamil Diaspora the minister alleged that the then government of J. R. Jayewardene had not taken timely action to prevent attacks on Tamils in the South in 1983 and Present UNP leader Ranil Wickremesinghe was also a Cabinet Minister of his government. Your face and gesture tell us how you are guilty about the defeat in this time.